J'adore Paris, les cuisines et la patisseries! (I adore Paris, the food and the pastries too!) So it was fitting that I chose this theme for my daughter's first birthday party. 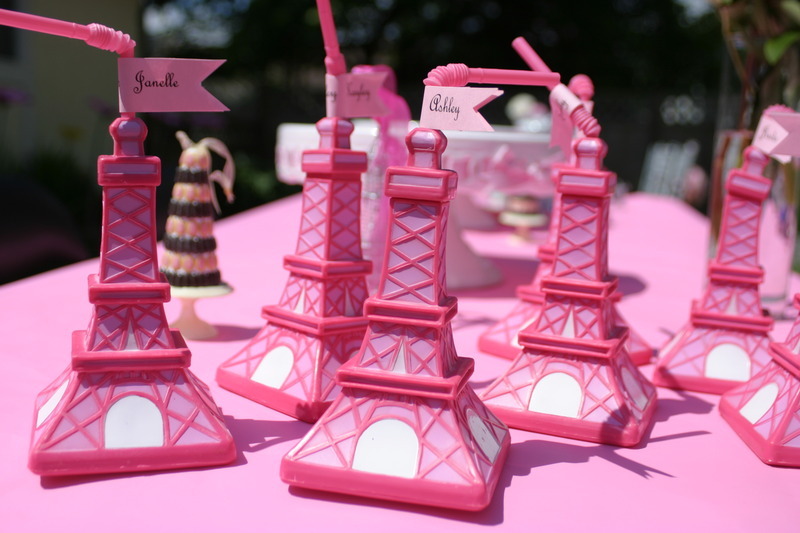 DIAMOND PLACE CARD HOLDERS http://www.weddingthings.com/product/diamond_shaped_glass_place_card_holder/glass_wedding_favors PINK EIFFEL TOWER CUPS http://www.birthdayexpress.com/Pink-Eiffel-Tower-Cup/50953/PartyItemDetail.aspx PINK POODLE IN PARIS http://www.birthdayexpress.com/browse/_/N-i/Ntt-POODLE/results1.aspx PASSPORT INVITATIONS and PAPER CAKE TOPPERS http://www.papercandee.com/ TARGET for Helium tank for balloons DAIRY QUEEN for ice cream cake. showing an 8" cake stacked onto a 10" cake. you have to do this yourself...they will not stack it for you. Plan in advance and be sure to get lots of helpers on the day of the party. This party took 4 months of advance planning. From the photo shoot for the passport photo ( on the invitation ) to ordering all the party supplies online and gathering all the details and planning the menu. Thanks to everyone who helped make this a super fun and memorable first b-day. Gotta go and start planning for next year! Those pink eiffel cups are eyecatching, a great addition to a tried and tested theme. What a lovely party! You did a great job! :) How was the photo booth done? Was it just a big poster? 5 stars! Can you please tell me where you got the eiffel tower drinking containers.